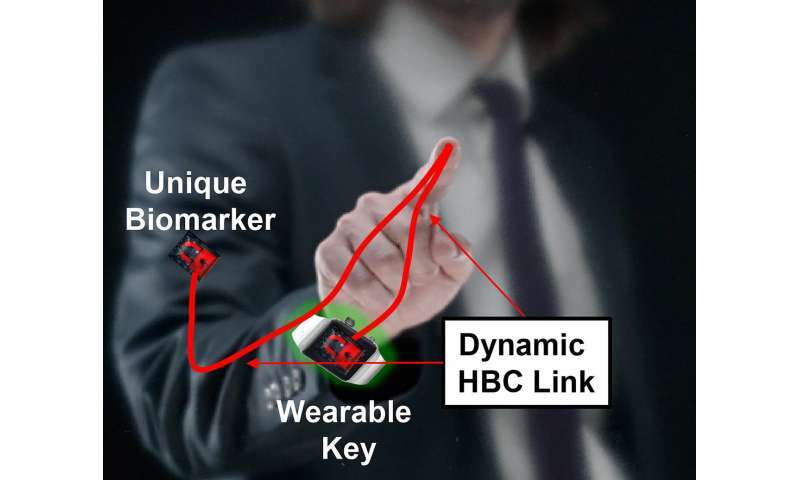 A group of Purdue University researchers have discovered a new way to use the human body as a robust communication medium for networking electronic devices in and on the body that promises to be far more secure and low-energy than any wireless system. 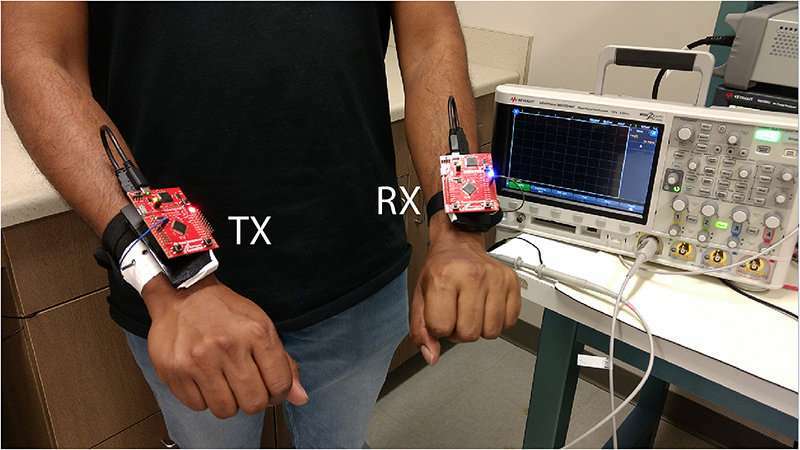 Shreyas Sen, an assistant professor in the Purdue School of Electrical and Computer Engineering, said this advancement allows devices to communicate through the body instead of sending a signal through the airwaves that could be hacked. The technology has several pending patent applications through the Purdue Office of Technology Commercialization. "We can achieve secure connectivity within devices in or on the body and even among devices on different humans and machines, at orders of magnitude lower-energy than wireless," Sen said. "The applications are fascinating." Among the possible uses for the human body as a communication network are implanted medical devices, wearable devices, secure payment technology, authentication applications and the millions of devices that fall under the Internet of Things (IoT) and the Internet of Medical Things (IoMT). One important application could be in medical devices. An example of using a body as a wire is a doctor reprogramming a patient's pacemaker or other implantable device without making an incision. The U.S. Food and Drug Administration recently recalled nearly a half million pacemakers because the federal agency was concerned hackers could gain access to the pacemakers through security loopholes—possibly allowing them to change the settings of the pacemakers or to turn the devices off. Using the body as the means to set the pacemakers could prevent such concerns. Human body communication would be far more secure than a wireless body area network because it is more difficult for an attacker to gain access to the physical signals, Sen said. "We are enabling the physical medium, but on top of that you have software-based authentication-based protocols. Only if you are part of my trusted group, then I'll give you more information. I may choose to include someone as my trusted group or exchange information with a stranger," Sen said. "With wireless, a criminal can snoop my signal. By using the body, you are making it harder because the criminal has to come and touch me." Human body communication also needs orders of magnitude less power than a wireless body area network, leading to a longer lifetime for the battery of implanted medical devices, dramatically increasing the time between surgeries. Other applications could take form in social settings, letting new friends share contact information or virtual business cards securely through a simple handshake. The advancement in human body communication will allow a handshake to be a secure exchange of data or even password. It also will allow a smart watch to interact with an implantable medical monitor and allow a doctor to reprogram a medical device inside a patient with a simple touch, Sen said. Personal usages include streaming music to a wireless earphone by connecting it to a smartwatch through the body, allowing the earphone to last much longer in a single charge. "The body is a very good conductor, thanks to its high-water content. So, you can use the body as a wire," Sen said. The human body picks up interference from the world around it such as FM radio signals. However, the Human Body Communication system developed at Purdue suppresses these interfering signals and allows for excellent communication between devices. Purdue researchers have published their findings related to this technology in ACM/IEEE International Symposium on Low Power Electronics and Design (ISLPED), IEEE Engineering in Medicine and Biology Conference (EMBC) and IEEE Design, Automation & Test in Europe Conference & Exhibition (DATE). By solving this problem, the body can now be used in countless ways as a communication medium. Purdue is looking for industrial collaborators and potential licensees of technologies to find other uses for the human body communication. "The field is wide open," Sen said. "There are endless applications for how the human body communication can be used to enrich our lives."